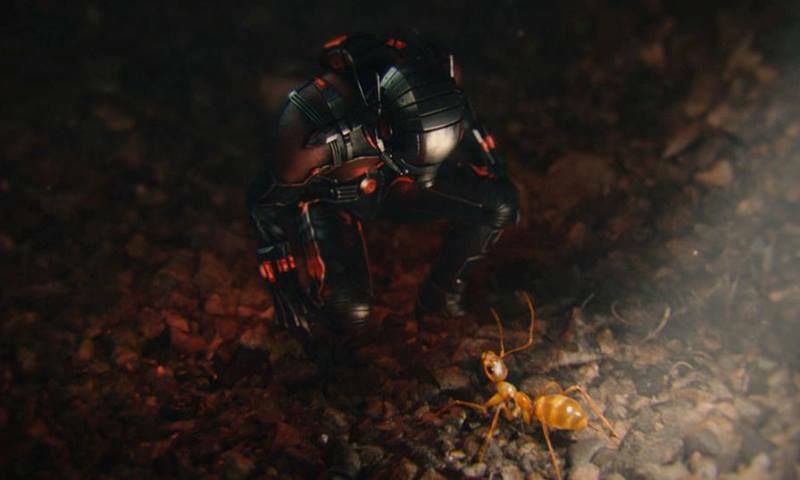 Marvel, the studio that brought you "The Avengers", is back with a tiny little film called Ant-Man which was brought to the screen by director Peyton Reed. 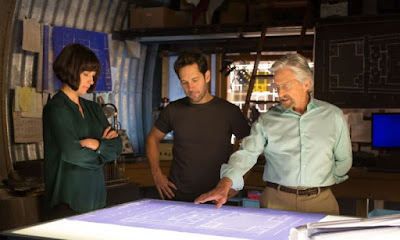 The movie features a cast that includes Paul Rudd, Michael Douglas, Evangeline Lilly, Corey Stoll. Bobby Cannavale, Judy Greer, Michael Peña, T.I., David Dastmalchian, Hayley Atwell, John Slattery, Martin Donovan, and Abby Ryder Fortson. 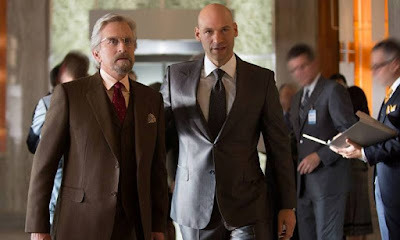 Dr. Hank Pym (Douglas), one of the founding members of S.H.I.E.L.D., has been hiding a secret formula for decades because of the potential danger it presents to the entire world if it were to fall into the wrong hands. 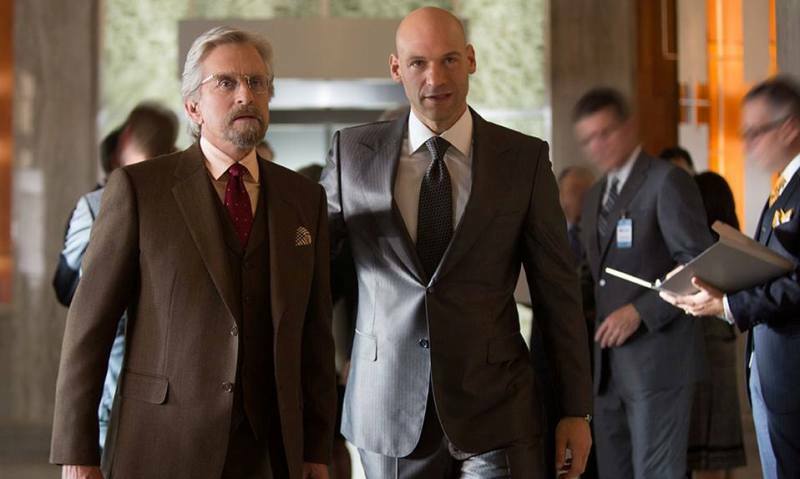 Pym's former assistant Darren Cross (Stoll) is now on the verge of creating the same formula so he can become rich, powerful, and more evil than he already is. Scott Lange (Rudd) is a man who used to break into places and steal stuff, but is trying to leave that life behind for the sake of his daughter so, of course, Dr. Pym asks him to break into a place and steal some stuff although this time it will be to help save the world. Marvel has a knack for creating movies that are very distinct and fall into specific genres while still maintaining a sense of style and continuity within their cinematic universe. This time around, they have asked Peyton Reed, who is best known for his work on Bring it On and Yes Man (Yeah, seriously), to create a movie that balances all of the super hero hi jinks with a heavy dose of comedy. 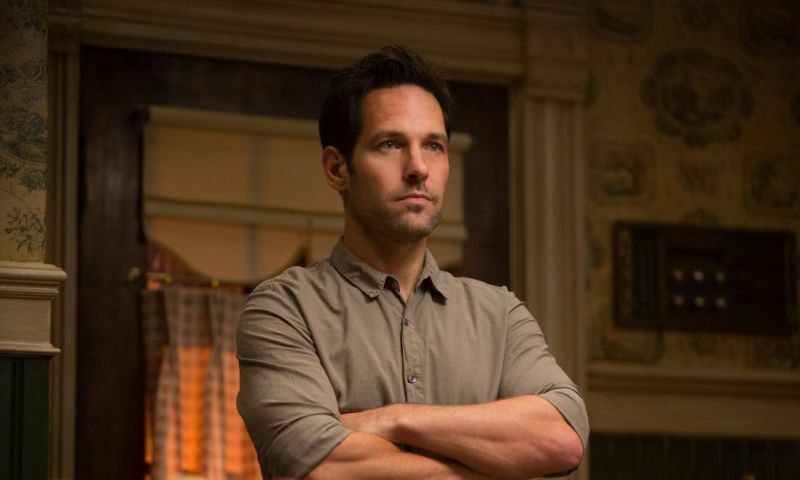 I have to say, the combination works brilliantly and a lot of that is due to having actors Paul Rudd and Michael Peña on board to give the comedic elements some much needed legitimacy. While Rudd has mastered the straight man routine in comedies like This is 40 and Knocked Up, Peña is funnier than I have ever seen him and I was very happy with both of their performances in this film. You can really tell that everyone was on the same page and having fun with this movie (see the clip directly below) and I believe part of that is due to the fact that, in a lot of ways, it really stands alone within the MCU and isn't burdened with having to weave it's way through tons of back story from the previous films. That being said, there is no doubt that this is a Marvel movie and the creators find some real clever and seamless ways to bring that world into the movie without it feeling forced or wedged into what is already there. I'd go into this a little more, but I don't want to spoil some of the fun surprises that are waiting for you so I'll change the subject now. 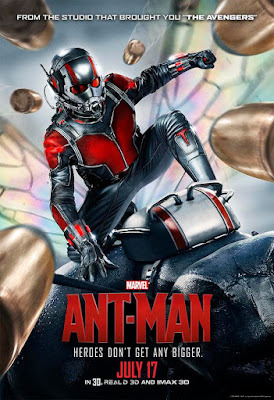 If you are one of the people who thought Age of Ultron was a bit much to handle with too many things going on and a general overdose of comic book craziness then you will be relieved to know that this movie really dials it back down and focuses on introducing characters and developing their relationships. 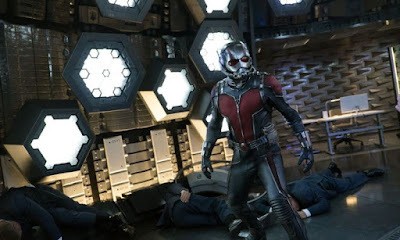 One of the key elements of the story touches on the emotional dynamics between parents and their children including Scott and his daughter, Pym and his daughter Hope (Lilly), and even the relationship between Pym and Cross. I would have to say this theme is essentially what holds everything together and Reed does an outstanding job of weaving all of these arcs together. Special effects houses like Industrial Light and Magic, Luma Pictures, and Trixter have all developed their products to the point where you really don't even think about how the stuff you are seeing on the screen was created, you just enjoy that it's there. My eyes never once doubted that Scott Lange was shrinking to the size of an ant or that other insects were at his beck and call doing anything from mundane tasks to attacking a large facility. You just believe that it's all happening and that allows your brain to dedicate more time to digesting the story instead of trying to process all the visual stuff being thrown at it. You could also tell there was a fair amount of practical effects involved, but there's no way this film could have been made without a heavy dose of CGI wizardry and it's all done very well. Yes folks, Marvel has done it again. This is a movie fanboys like me will love for how fun and nerdy it is and casual fans will also love it because it's a really good, quality comedy that just happens to take place in the world of super heroes and diabolical villains. The one MCU movie I would most compare this to is the original Iron Man for how grounded and relatable it is and I feel that Ant-Man was the perfect way to close out Phase 2 and let us all catch our breaths with a few laughs before next year's Civil War breaks out and eventually leads to the Infinity Wars and beyond. I did not see the movie in 3D or IMAX and, from what I understand, neither are essential to enjoying the film. As is almost always the case with Marvel films, 3D cameras and IMAX cameras were not used in the creation of the film so the "upgrades" were added in using a digital post conversion process. If you choose to see the movie in either format have fun although I really don't believe the result will justify the added cost.